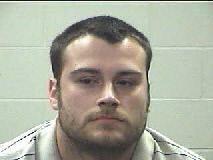 25 year old Gabriel Thomas Price of Porter was charged with his second DWI. Porter Man Gets Second DWI, GOODRICH, November 11, 2012 - At approximately 1:20 am on November 10, 2012, Deputy Dustin Lowery with the Polk County Sheriff's Office was on Patrol on US-59 in Goodrich. Deputy Lowery spotted a tan Chevy Sonoma that was north-bound on 59. The truck was driving erratically, swerving, and speeding up to over 80 miles per hour. Lowery initiated a traffic stop. When Lowery spoke to the driver, Gabriel Thomas Price, 25, of Porter, he could smell a strong scent of alcohol. Additionally, Lowery spotted a cooler in the back of Price's truck that contained a large bottle of whiskey and beer cans. Lowery was soon joined by Sergeant Lee Rogers (also with the Polk County Sheriff's Office) and Trooper Ramey Bass with the Texas Highway Patrol. Lowery performed a field sobriety test and placed Price under arrest for driving while intoxicated. Price's vehicle was recovered by LakeView Wrecker Service and will be stored in Livingston. Sergeant Lee Rogers (right) and Trooper Ramey Bass. Trooper Bass lifts up a large bottle of whiskey from Price's truck. Faithful, dependable, true: Mixi was on the job.